The Final Issue— There will be no more. (Photo: Mark Otnes) Click to enlarge. Down in our mail room today, we received shipment of a rather poignant publication—the FINAL issue of the official membership magazine of the G.I. Joe Collector’s Club (GIJCC). To be honest, we’re not going to miss it. Not one bit! Despite Fun Publication’s best efforts over the years, we remain firmly on the side of Joe-fandom that has long argued the club’s newsletter has always been steered in the wrong direction, content-wise, and have considered it as (basically) one BIG “missed opportunity” for GIjOE-fandom (sorry!). Yes, we know economics drive business. We understand also why the club had to make the decisions they did. But in our ideal (fantasy) universe (where we get everything we want), we firmly believe(d) that the official newsletter of our “hallowed” GIjOE Collector’s Club should have been something altogether different—and in so MANY ways. Of course, discussing all those sorts of ideas, especially now that the club is “kaput,” is all water-under-the-bridge, Monday morning quarterbacking type of thinking— i.e., it’s ultimately pointless. Continuing our theme of complete honesty on this topic, for 12-inch GIjOE collectors, the average “read time” of each issue was typically just under a minute, often before the magazine was (sadly) tossed straight into a trash can or recycling bin. Yes, for fans of the “little Joes,” there was always more content of interest, as those members were the magazine’s primary demographic and intended “readership target.” And some members, despite openly caring little for the publication, readily admit they’ve kept every issue (show of hands, please) and even bagged them and put them in magazine files. Will missing issues command larger prices now? That remains to be seen. 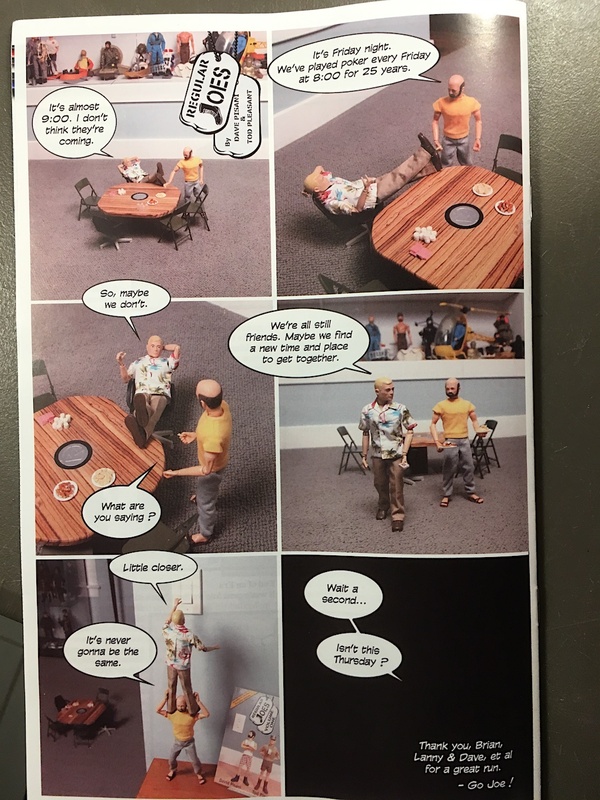 Goodbye “Regular Joes”— The back page of the final issue of the GIjCC newsletter features the last-ever comic photo-strip of the popular 12-inchers fondly known as the “Regular Joes,” created by the creative team of Dave Pisani and Tod Pleasant. We’ll probably miss their funny misadventures more than anything else the club has ever published! (Photo: Mark Otnes) Click to enlarge. Bottom Line: Fortunately for 1:6 scalers, the magazine’s (final) guest reporter, Greg Autore did an admiral job penning an article entitled, “GIjOE Classic Collection—The Final Figures.” It—is—GREAT! We only wish Greg had submitted it to us HERE at The Joe Report, first (so we could’ve gotten the scoop, HA!). And bonus spoiler— Autore’s supporting photos even show some GIjOE products we’ve NEVER seen or heard of before. That sort of Joe-history revelation is ALWAYS exciting. OOHyeah! 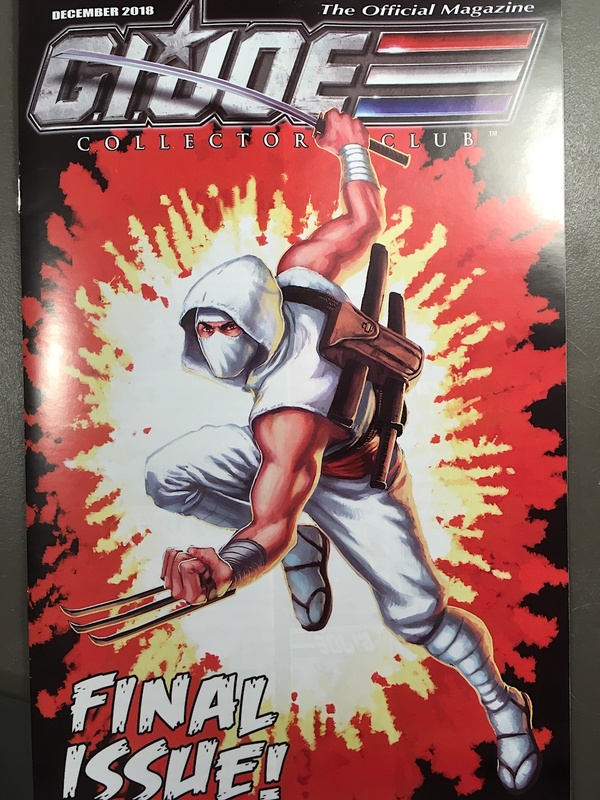 It’s hard to believe that this is the end of the GIjOE club (at least in print form). It remains to be seen now, how long the club will keep its website up and running. Once all remaining club merchandise is sold, there’ll be little incentive to keep paying for the site’s upkeep and maintenance. Regardless of the date of the club’s “ultimate demise,” our sincerest THANKS go out NOW (again) to Mr. Savage and the GIjCC. You guys RULE! Go, JOE!